A bit of personal background, to give certain decisions more context: I have been developing user interfaces for over 20 years. Java and OOP have been loyal companions throughout most of this time. A few years ago, I started doing more and more FP, mostly in Scala & Elm, but also in Java (hi vavr 👋). Our team members come from all sorts of backgrounds. When deciding on a web app stack, opinions varied a lot. We finally settled on React/Redux + TypeScript as a compromise – it turned out to be a good decision. Super concise and very safe to use. We want to have types which can be distinguished by the compiler because they have different names, even though they share the same structure (a string). This is known as “nominal typing”. The TypeScript Deep Dive Book gives a good list of nominal typing patterns. As a developer, CSS has always been the scary corner of my applications. It uses a global namespace, you cannot use variables, and it’s almost impossible to tell which code is even in use at all. So you end up treating your CSS very differently from the rest of your code: no refactorings, no re-use, no clean-up. Thanks for reviewing this post, Ben! Tooltips cover the details-on-demand aspect. However, in order to provide such details in an appealing way, built-in SVG tooltips are often not sufficient. There’s actually a pretty good technology out there to design appealing graphical UI elements: SVG! It is way superior to simple text boxes. Good News: If you’re using React, I have got you covered! 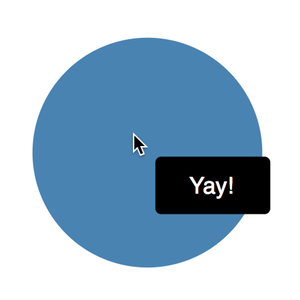 Meet react-svg-tooltip, my npm package that addresses all SVG tooltip needs. 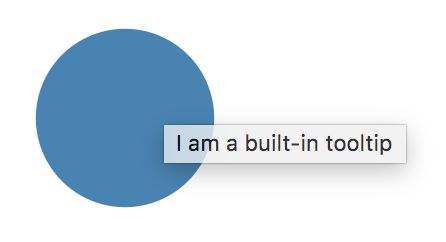 Arbitrary SVG can be used as tooltip contents. In fact, the library itself does not provide an actual tooltip. Instead, it gives you a 0-based coordinate system, so you can place your favorite SVG elements in whichever style suits your needs. Contents are attached to the root svg element (using a React portal behind the scenes). Thereby your tooltip will always be rendered last, i.e. always on top. As usual, all code is on GitHub, feedback is very welcome, and PRs are highly appreciated! Two days ago, GitHub announced the support of HTTPS for custom domains. In addition to this blog, I maintain a few websites for friends and family, all configured through A records – time for migration! Officially, the migration is a simple matter of toggling the “Enforce HTTPS” button, but the button was disabled for all of my sites. The explanation wasn’t particularly encouraging: Unavailable for your site because your domain is not properly configured to support HTTPS. Well, time for RTFM (not my favorite hobby). First things first: Prepare your site’s content. Ensure that all your assets (links to CSS, JS, etc.) are loaded via HTTPS. Otherwise browsers might block your “Mixed Content”. In order for GitHub to detect that your site is now ready for migration, you apparently need to trigger a detection script. Any change to your repository’s CNAME file will do, so e.g. make a minor change and revert it, or make a harmless whitespace edit. As a result, GitHub will now generate the certificates necessary for HTTPS. It might take a few hours, but as soon as this message is gone, you can access your site via HTTPS. Check that everything still works (particularly your new HTTPS asset links). Once you’re happy, toggle the “Enforce HTTPS” switch – Voilà!